Yes, this is an “Away” biryani – “away” in Europe that is. It’s almost second nature now to go to a new place and stake out potential biryani candidates. For example, whilst at Wimbledon yesterday we noted with interest “Wimbledon Tandoori, Rajdoot Tandoori, Jubraj Indian, and Spice of India (of life, of London, etc .etc). It was the same when we went to Geneva about 10 days ago. 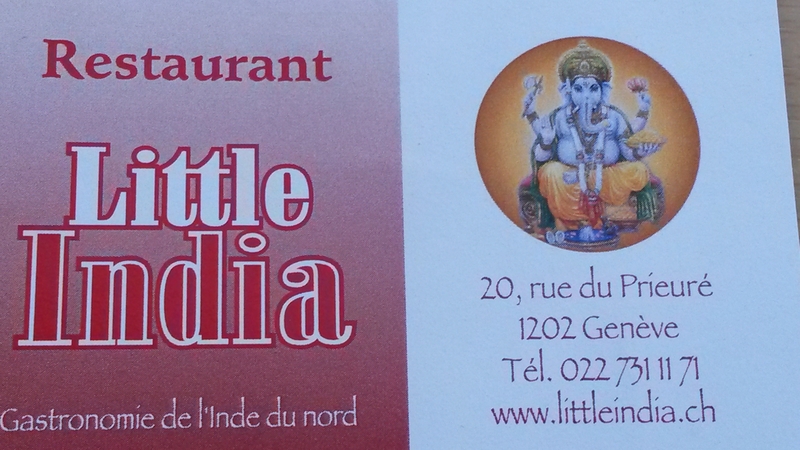 Everywhere I looked, there were little exotic Indian restaurants trying to jostle for my attention. The eccentric Café Gandhi Tandoori (a bit of an oxymoron this one, given Gandhi’s strict adherence to vegetarianism); the expensive Rasoi, where as my sister informs me the chef is a Ranji Trophy wicketkeeper; Bombay Restaurant; and Little India. Finally, it was my thirst for finding out if the biryanis in Geneva were better than the ones at home that made me succumb to the allures of Little India. Also, my sister had heard good things about it so at the end of a grueling day we found ourselves hanging out in the takeaway waiting area of this lovely little restaurant. The exciting smells coming out of the kitchen had the effect of Ulysses’ sirens on the son and my niece -they wanted everything on the menu. A slight problem as we would have had to win the lottery to afford it. At 26 francs (approximately £19) the chicken biryani here was one of the most expensive biryanis we’ve had – so I expected the fried onion layer on the top to at-least have flecks of gold! We took only one portion home for seven people and I must say it was finished in seconds. Verdict: it was a decent biryani but nothing different to what we get here. It was as dry as some of the biryanis I’ve tasted in London and as lacking in masala. No fried onion layer (gold or otherwise), and absolutely no hint of potatoes. But all and all a rather pleasing experience. If I do have the money next time, I will definitely go back to try their other dishes – as I said earlier, the aromas coming out of the kitchen were awesome! This entry was posted in Biryani and tagged biryani, chicken biryani, Indian food, indian restaurants in switzerland, little india geneva, little india geneve by Poornima. Bookmark the permalink. I so agree.. and without the nice taste!